If you’re like most people, setting boundaries is not easy for you. Maybe you’ve experienced rejection for having asserted your boundaries. Or you’ve been mocked or shamed for having an “uncool” boundary, for being needy, for demanding too much. Or maybe someone just flat-out ignored your boundaries. Did things to you that you didn’t like, need or want. Railroaded you into situations where you stopped bothering to figure out what your boundaries even were, because what is the point. One way or another, you learned that you having boundaries was not okay. BUT WHAT IF YOUR BOUNDARIES AREN’T THE PROBLEM? You don’t have to justify your boundaries. You don’t have to be certain to set a boundary. You’re allowed to set a boundary, even when things aren’t totally clear to you. Your boundaries are what allow you to get close to people. Your boundaries can be flexible according to how you feel or what you need that day. Your boundaries are expected change over time… in any direction. Your boundaries are beautiful, necessary, and will change according to context. That’s the truth. YOUR “YES” TELLS YOU WHAT IS VALUABLE TO YOU. not more, important. Boundaries aren’t just about keeping things out. They’re also about taking a stand for what matters to you, whether that is your alone time, your agency over your body, your creative flow, your spirituality, your core values, your sense of safety or any of a million other things that might matter to you. 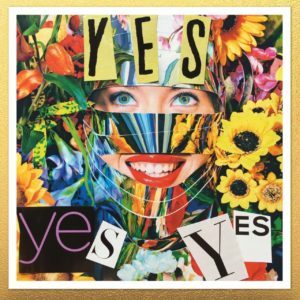 Your boundaries are, at their core, about protecting and nurturing your “Yes.” When you learn to truly honor the importance of these Yesses in your life, it becomes easier to create the space for them that you need — without guilt or shame. EVERY “NO” IS A “YES” TO SOMETHING ELSE. Healthy boundaries are more than just keeping people and things you don’t want away from you. When you listen to and honor your boundaries, you keep the parts of you that are precious to you from spilling out to people and projects that are not worthy of that preciousness. Your boundaries give the beautiful parts of yourself form and shape. Healthy boundaries both filter out the bad, and maintain the integrity of your gifts. 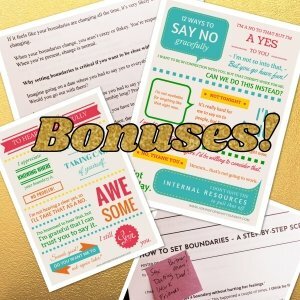 THE BETTER BOUNDARIES CRASH COURSE IS YOUR ROADMAP TO GUILT-FREE BOUNDARIES. This is everything I cover with my clients when we have an hour or two talk about boundaries. In addition to the audio recording, there are handouts! Glorious handouts! Who doesn’t love a good handout? There are a few brief exercises, and the whole class will take you about an hour and a half to complete. And you can go back to the material over and over again! THERE ARE SO MANY REASONS TO GET THE BETTER BOUNDARIES CRASH COURSE — WHAT’S YOURS? It’s common to feel shame or guilt for having boundaries. Many of us were taught that we’re supposed to accommodate other people’s feelings, needs or preferences even at great cost to ourselves, in order to earn safety, love or belonging. The truth is that your boundaries are beautiful, and they are what help hold and protect the best parts of yourself. You not only are allowed to have boundaries; you are entitled to them. I WANT TO BE ABLE TO SAY NO EASILY WHEN I HAVE TO. Life is more complicated than just simply saying Yes or No to stuff. That’s why I included a step-by-step boundary script and some clear one-liners, so you’ll always have something in your back pocket when you need it. I WANT TO KNOW WHAT TO DO WHEN I DON’T KNOW WHAT MY BOUNDARIES ARE. There’s no shame in not knowing your boundaries, especially when you’re in a new situation, or when you’re used to outsourcing them to other people. 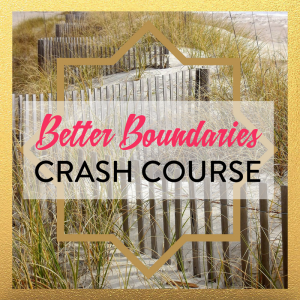 The Better Boundaries Crash Course will give you a few courses of action, from what to say to when you don’t know, to steps you can take to figure out what your boundaries are. I WANT MORE EASE AND INTIMACY IN MY RELATIONSHIPS. It’s counter-intuitive, but boundaries are what enable us to be close to other people. When you’re clear about your boundaries, many common communication snafus get smoothed out, and there is space for more connection and intimacy with your friends, family and partner. I WANT TO HAVE MORE TIME, ENERGY AND MONEY FOR THE THINGS I CARE ABOUT. Many people think that boundaries are all about saying no to things, but in truth, they’re as much (if not more) about saying YES to what you truly value. Better boundaries mean you can stop wasting time, energy and money managing the fallout of going along with things you don’t really want. You’ll feel more spacious, free and relaxed and have the time, energy and money you need for the things you really care about. COME! SEE HOW MUCH EASIER BOUNDARIES CAN BE! Learn the difference between your boundaries, limits, and walls. Have a script in your back pocket for sticky situations. Learn what to say to avoid pushback. Give yourself permission to change as needed. Create more intimacy and ease in your relationships. Audio. Handouts. Checklists. One-liners. Scripts. DOWNLOAD THE WHOLE SHEBANG FOR ONLY $37! After 13 years of helping people find and say their boundaries at Cuddle Parties, coaching hundreds of clients about what is and isn’t okay for them, working with group facilitators to support their students’ boundaries, and leading the Good Girl Recovery Program, I’m pretty comfortable saying I’m a boundary badass. I wasn’t always this way though. Raised in the south, and socialized as a girl, I was taught to demur, accommodate, go along with things and acquiesce, which worked, I guess. 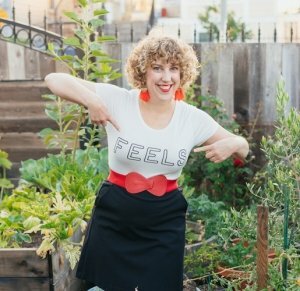 The problem was that it often landed me in situations where I was doing a whole lot of what I didn’t want to do at work, with friends, in relationships, and in the bedroom. Getting good at my boundaries has made life a million times easier. I still get to be kind and generous — without being a doormat. I want that for you too.